If you are surprised to see yet another chocolate recipe here on the blog, let me be the first to welcome you to my little corner of the internet because you must be new around here. If we are being honest, my blog name should read something like Browned Butter Chocolate Covered Blondie. If there is one thing you should know about me it’s that chocolate is my kryptonite. I’m completely obsessed with aaallllll the chocolate things and I’d be lying if I said I don’t lie awake at night dreaming up a decadent, chocolate-laden dessert. My sweet tooth accepts chocolate in all forms. Chocolate cake with chocolate frosting, a chocolate chunk cookie, a rich, double chocolate brownie. I’ll even take my chocolate in the form of a dark chocolate square in the checkout line at Trader Joes. If I’m really desperate, a handful of bittersweet chocolate chips from the kitchen pantry will do. Not a day goes by that I don’t have at least a smidge of chocolate something-or-other. And while I’ve tried to quit chocolate, you know how the saying goes….I’m no quitter. Needless to say, there are no shortage of chocolate desserts in my archives. 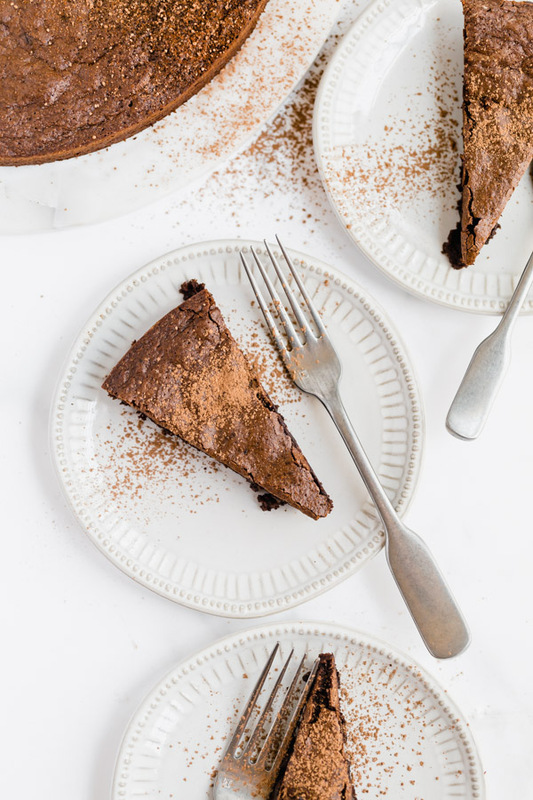 But since you can never have too much of a good thing I bring you this Flourless Chocolate Almond Cake. It checks A-L-L the boxes on my checklist for the perfect dessert. This flourless dessert is like the little black dress of cakes…it’s pretty, it’s practical and it’s easy to throw together in a pinch. Not to mention, it will always get you a compliment. A fancy cake that only looks fancy is just as essential in your baker’s repertoire as a little black dress is in your closet. Like that LBD, you can take this single layer cake anywhere and it never goes out of style. Trust me when I say you neeeeeddd this in your life. I’m 99% sure I say that about every recipe on the blog, but you get the point. 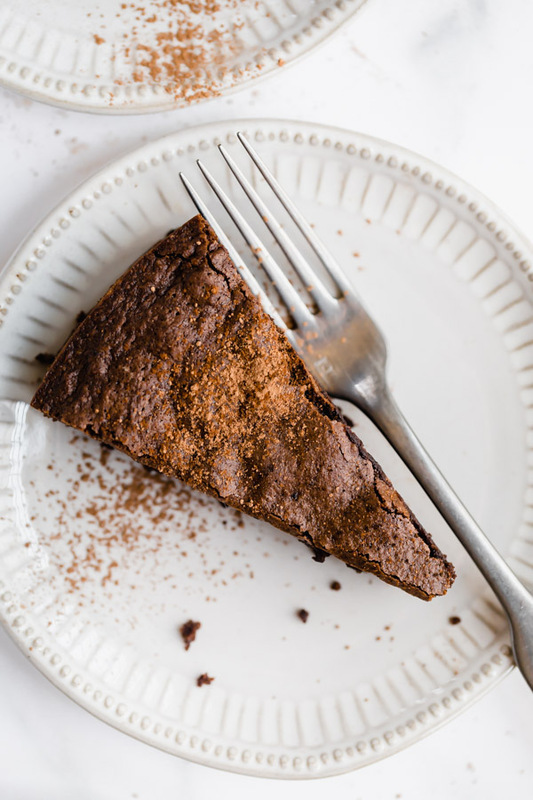 This Flourless Chocolate Almond Cake is deceptively easy to bake and will impress even seasoned bakers at your next dinner party. It’s rich in flavor, ever so slightly gooey and will please even the most discriminating chocolate lover. 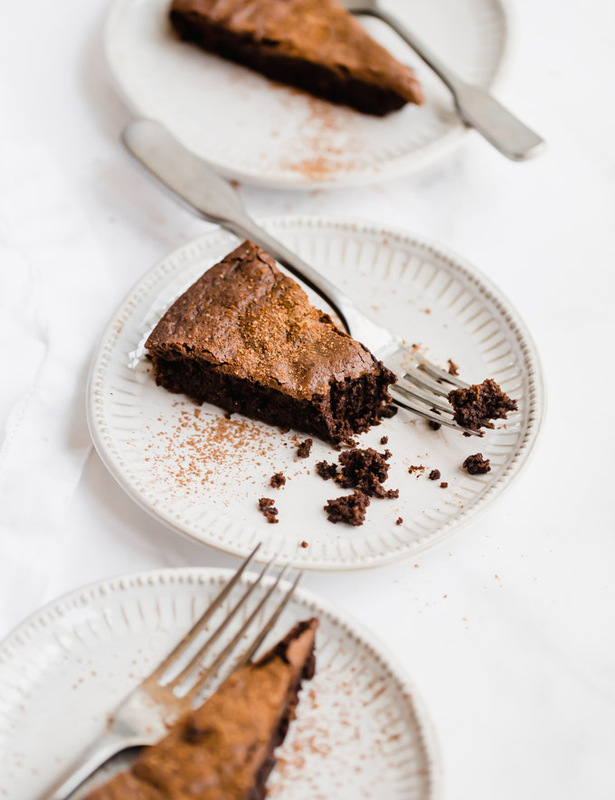 And let’s just take a minute to appreciate that gently crackled top which makes this cake a standout when sprinkled with a dusting of cocoa powder or confectioner’s sugar. Or a dollop of cold whipping cream. Your choice…there are no wrong ways to serve this cake. Oh, and the cake gets major bonus points because it’s made with almond flour which makes this the perfect sweet something to share with your gluten-free guests. I told you this cake checks aaalllll the boxes! I happen to have one last slice of this cake in the fridge so I’m going to sign off and go savor every last crumb of this Flourless Chocolate Almond Cake. It’s seriously swoon-worthy and I hope you’ll bake one soon. 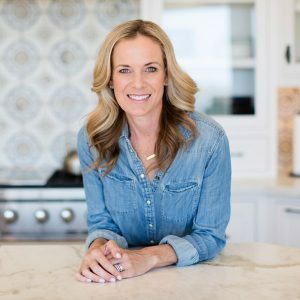 I love hearing from all of you bakers out there so leave me some love below in the comments. In next week’s blog post we are diving deep into all things fall. I couldn’t be happier that sweater weather is upon us and I have lots of pumpkin spiked, cinnamon-sugar-dusted, maple-pecan-drizzled goodies up my sleeve. Until then, lots of love and blondies! 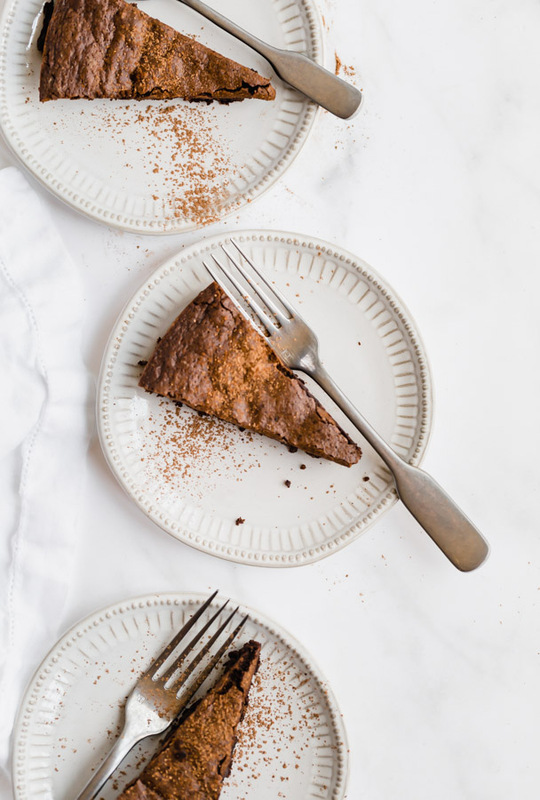 A flourless cake with rich, chocolatey flavor, a slightly gooey center and perfectly crackled top makes this single layer cake an impressive dessert for your next dinner party. This gluten free cake is made with almond flour and will win over even the most discriminating chocolate lovers. Cake can be stored tightly covered at room temperature for 3-4 days. The gently cracked topppppp!!! agree. These look amazing, friend. Thanks Karlee!! This cake is my go-to for everything and that slightly cracked topped is the best!! Exactly! It’s perfect for both!! I love taking this cake to dinner parties….everyone always loves it!